How To Clean Your LCD, LED & CRT Monitor TV Screen? Liquid Crystal Display (LCD) monitors and Cathode Ray Tube (CRT) monitors does not just look separately rather they are different in all aspects. Cleaning the LCD monitor screen is the biggest issue which I sometime feels. 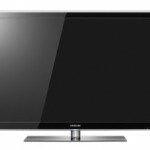 Which type of cloth to use on the LCD screen surface? This question is the most widely asked, because no one wants their expensive LCD or LED monitor screen to get damaged. I have seen many people using rough cloth for such purpose which is wrong and can damage the screen. Author Talal MasoodPosted on March 22, 2011 March 25, 2011 Categories Hardware, How-To GuideTags Cleaning CRT, Cleaning LCD, Cleaning Monitor, CRT, CRT Monitor, LCD, LCD MonitorLeave a comment on How To Clean Your LCD, LED & CRT Monitor TV Screen? 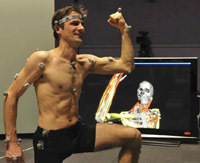 Now you can check the activity of each individual muscle while you are working out or doing some sort of exercise with the latest technology called Magic Mirror. It has been developed under the supervision of Prof.Yoshihiko Nakamura of the Information and Robot Technology Research Initiative. The first time unveiling of this exciting new piece of tech was done last Friday in the same university. 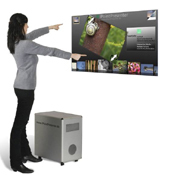 Magic Mirror gives out the real time computerized images of the whole body and uses different colors for muscles to make you exactly what is happening inside your body. The electronic version of Rubik’s Cube was a great addition to puzzle games. Now ThinkGeek presents you with the electronic cube puzzle game which is looks great and promises to be a good time pass. 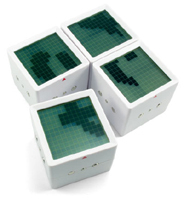 The puzzle game comprises of 4 cubes, each with a electronic display. Every puzzle cube comes up with a separate image, then you have to arrange all the cubes and join together to make the full image. Moreover, not only does it has images it also features words to make. Read more for the video of this electronic interactive cube puzzle game. SONY is going all wild with the introduction of their new 65″ GXD-L65H1 LCD, making it totally water proof and freeze proof. All over the news of this launch is making people think that what really could be purpose of making such a LCD. Well all one can say is that, it is meant to attract the consumers from the ‘North Pole’. In my opinion i don’t find any usefulness of this Waterproof LCD, why would someone actually buy a $20,000 LCD just because it waterproof and cannot be frozen. I think SONY has gone a little too much out of the box !!. Sometimes when we see something,its not actually like that as we thought of it to be.I got my hands on some really amazing and interesting pics,which i would love to share with you guys here.These pics have no photoshop effect and are totally natural. Author VickyPosted on February 6, 2009 February 6, 2009 Categories Computers, Photo GalleryTags Computers, LCD, Monitor, photography, screen, wallpaperLeave a comment on Amazing LCD Screens !! !